Hello, my name is Val, and I’m addicted to soap-making. (especially soapy pictures) so please bear with me as I try to figure out all of this blogging jazz. I’m hoping this may help spare my FB friends from my daily photo assault on them, but who knew there were so many features to figure out? This gave me a chuckle. I’ve been a massage therapist for a grand total of six years already, for goodness sakes. No, there is no way I will ever learn everything about what I do for a living. There are so many different modalities, and I think continuing to learn and grow is essential to a persons fulfillment and happiness. This is something I appreciate about my big, fat soaping hobby, too. I call it big and fat because it is taking up a huge amount of space in my house. Who needs living space anyway? I learned how to make soap a short year and a half ago, and who’d a thought there were so many different ways in which it can be made? It is truly a wonderful mix of chemistry and art. I’ve always been creative by nature, and will admit that I am one who enjoys the ‘art’ part more than the math. That being said, I have to give kudos to anything that get’s me excited to do math! 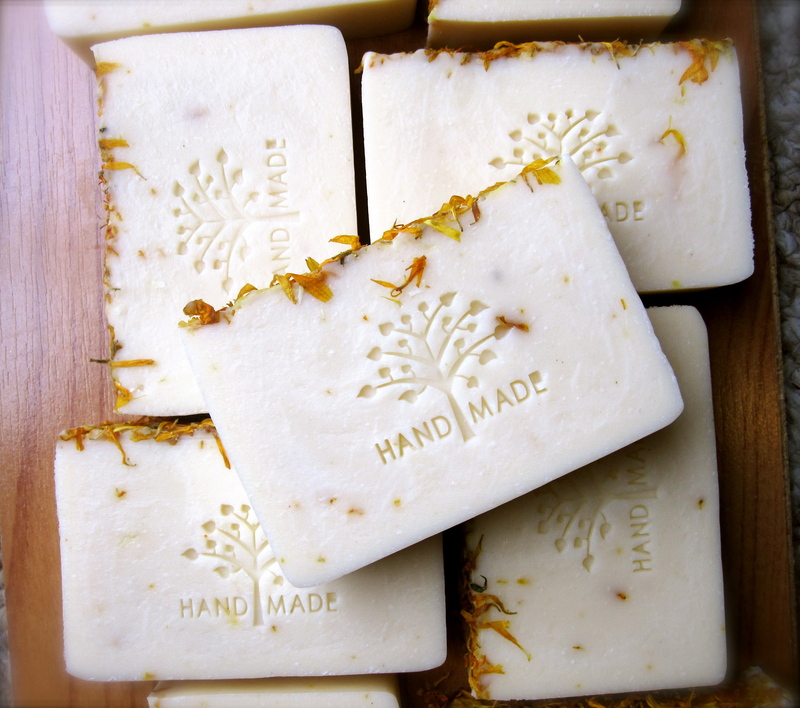 True soap is made when an alkali (lye) combines with a fat (my beautiful oils) to produce a salt, which is soap. The heat-producing chemical change that occurs when these substances are combined is called saponification. The final soap has no active lye in it, although it does retain a percentage of free floating oils (this is a good thing and is called superfat, hey! what’d you call me?) and a wonderful by-product of that chemical change, which is glycerin. Glycerin is humectant in nature, meaning it attracts water from the atmosphere to the skin. This makes the soap feel mild and conditioning. In commercial soap making, glycerin is skimmed from the soap and sold to produce other products. Not only would I not have a clue as to how to skim the glycerin from my soap, but I would never want to do that! Herein lies the difference between commercial and hand-made soaps. 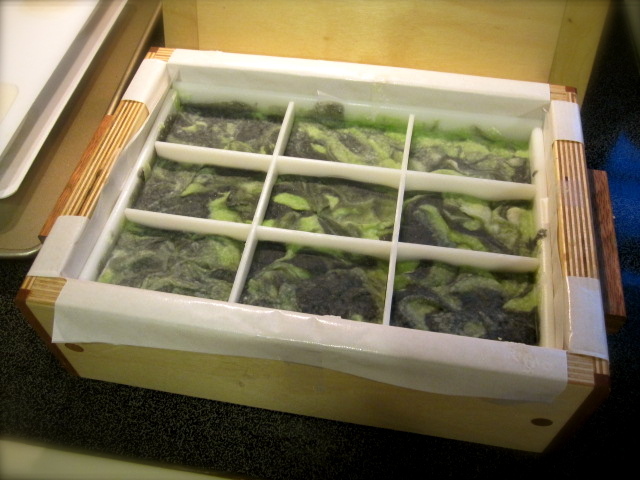 As my crafty forum-friends will attest to, there is nothing like waking in the morning to a fresh batch of soap ready to come out of the mold! This is an Activated Charcoal swirled, 100% Coconut Oil/Coconut Milk Sea Salt soap, scented with Lime, Citrus-Basil and Eucalyptus. I find Sea Salt soaps especially refreshing in the summertime. It smells really fresh, I’m going to call it “Cool Citrus Herbal” or something..and now the long wait for cure begins. I like to cure my salt soap for three months, so this one won’t be ready until October! Posted in My Hand-Made Soap and tagged activated charcoal, bath and body, coconut oil, glycerol, sea salt. Bookmark the permalink. Val, you’re the best soap maker i’ve ever known!!! I love all your soap. Not only does it smell delish, but its sooo beautiful!!!!!! Keep up the great work!!! You don’t know anyone else who makes soap, ahh-HAA! That was the most informative thing I have ever read at 630am! You know I love your soap and it just so happens I need some. I want that new charcoal eucadelicious basil number you described. Great job, u should be a writer. Don’t worry, I’ll let you know when the eucadelicious basil number is ready. Until then, I have plenty more to choose from, stop by! Hi Val! I love your new blog! Pinned you! Thank you, Kerrie- so funny, I just visited your blog, too, you owe me a coke!! This is my first-ever comment on a blog! I love your beautiful soaps. I haven’t made soap in years but I need to replenish my personal stock and use up some of my essential oils. You have inspired me! I need to investigate salt soaps. I also wanted to mention, when I had my handcrafted soap business, I was also a massage therapist. 🙂 The two fit together hand-in-glove. Hello Valerie, would you consider sharing your recipe? I have been looking all around for 100% coconut oil and activated charcoal recipe. Your adding sea salt is genius. I don’t sell soap, I just make it and share it with my 5 daughters and their families. But I am addicted. 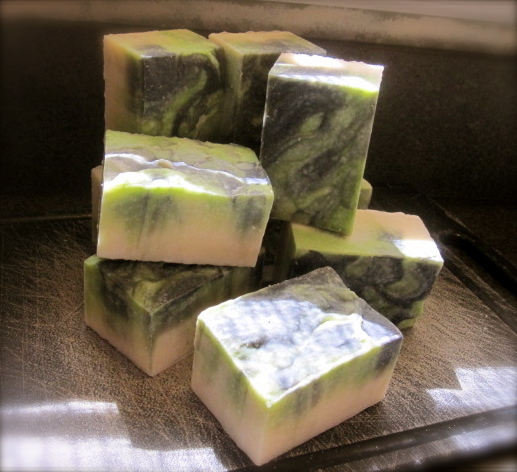 Sure, I found this great recipe on the internet, back when I first started making soap. I’ve tried 100% coconut oil salt soap, but I liked this one better! It’s made with 85% coconut oil, 10% avocado oil, and 5% castor oil. The superfat is 15%. If you’re going to make a 100% coconut oil soap, I’d leave a bigger lye discount, probably 20%. Enjoy!